With over 140,000 miles of public road, Kansas has the country’s third-largest state highway system after Texas and California. Kansas is also said to be flatter than a pancake – that can make for some easy driving along the plains, which are often filled with wheat, a grain it produces more of than any other state. Oftentimes, researching car insurance isn’t easy, and can lead to some bumps along the road. Many of us would prefer to put it off or avoid it altogether. We want your ride while you shop around to be a smooth one. So, you’ll find everything you need here – your one-stop guide to all things insurance and then some. We’ve got the best coverage and rates, information on providers, and safety options to consider when you choose your insurance. To top it off, you’ll also learn about state laws and driving statistics. Enter your zip code now to search for the best car insurance rates in Kansas! It can be tough to pay lots of money every year for a car insurance policy. Kansas requires all drivers to have insurance and finding the best coverage and prices can be frustrating. We’re going to explain insurance options, rates, and companies to help you understand what you’re buying. So, look no further. Let’s dive in! Kansas is a “no-fault” accident state, which means that you submit your claim to your insurance company. Your basic Personal Injury Protection (PIP) coverage will pay for your medical bills and certain other out-of-pocket losses regardless of who caused the crash. Liability insurance pays everyone owed money for property damage and/or injuries from a car accident that you or anyone under your policy has caused – drivers, passengers, pedestrians, bicyclists, etc. State law requires drivers to also carry uninsured/underinsured motorist coverage with minimums of $25,000 per person and $50,000 per accident. Kansas law requires drivers to have car insurance and to show proof of coverage when a law enforcement officer asks them to do so. The Sunflower State doesn’t have a financial responsibility law but accepts the SR-22 and SR-26 for major convictions such as driving under the influence. The filing requirement period is one year and terminates automatically with no notice to the Kansas Department of Revenue – Division of Vehicles at that time. If coverage ends in less than 12 months, an SR-26 is necessary. The driver is required to keep the SR-22 valid and current with the state for one year. The one-year period begins when the Division receives the SR-22. Next, we’ll look at how much the average Kansan spends on car insurance to help you determine how much you can afford. In 2014, the annual per capita disposable personal income (DPI) in Kansas, after taxes have been paid, was $41,634. The average annual cost of car insurance in Kansas is $851, which is two percent of the average DPI. The average Kansas resident has $3,470 each month to buy food, pay bills, etc. Car insurance will take about $71 out of that, and possibly more if your driving record isn’t clean. The above data is from the National Association of Insurance Commissioners. You can expect car insurance rates in Kansas to be significantly higher for 2019 and on. Remember: though having the required insurance is important, you should also buy additional coverage to protect yourself and others in case you’re in an accident. Next, you’ll find extra coverage options you can add to a basic insurance plan. Kansas drivers also can buy optional medical payments coverage (MedPay) of at least $5,000 to cover more medical expenses after an accident regardless of who is at fault for the crash. How much risk you’re willing to take when you drive is up to you, whether you want to get the minimum or buy more coverage to protect yourself and your loved ones from extra costs and potential lawsuits from damaging accidents. The experts at the Wall Street Journal advise drivers who buy liability insurance make sure that they increase the limits to 100/300/50. Now, let’s see some stats about loss ratios in Kansas. A loss ratio compares how much a company spends on claims to how much money they take in on premiums. A loss ratio of 60 percent indicates the company spent $60 on claims out of every $100 earned in premiums. MedPay is optional in Kansas, however, uninsured motorist coverage is required. In 2015, 13 percent of drivers in the U.S. and 7.2 percent of motorists in Kansas were uninsured, despite the potential penalties. Kansas ranked 44th in the nation in 2015 for uninsured or underinsured drivers. Unless you sign a form that states you don’t want uninsured motorist coverage, your agent is legally required to provide it to you. One helpful resource is Auto & Homeowners’ Insurance Shoppers Guide by the Kansas Department of Insurance. It details all the insurance options available. And, the information doesn’t stop there! The Kansas DOI’s Auto Shoppers Worksheet is a useful checklist for finding the best rates. You can add many powerful but cheap extras to your policy. One option is Usage-Based Insurance programs (UBI), such as SmartRide from Nationwide, Snapshot from Progressive, or Drivewise from Allstate. They give discounts to drivers based on how well they drive. Here you’ll find the Most Expensive Demographic rates in Kansas. Regardless of your age, gender, or marital status, it pays to find the best rates. Let’s see the most and least expensive cities for car insurance in Kansas. We have all the information you need to find the best rates and coverage. We’ve researched the biggest car insurance companies in Kansas to help you in your decision making — company ratings, complaints, and much more. So, don’t worry about making the wrong choice. There’s no need to feel overwhelmed, either. Trust us to guide you through this process. AM Best assigns financial ratings to insurance companies. A good score means they’re likely to stay solvent and be able to pay customers’ claims. When a consumer is unhappy with an insurer, they can file a complaint. This feedback is part of a company’s complaint ratio, which is the number of complaints a company receives per one million dollars of business. If you want to file a complaint against an insurer in Kansas, fill out this online form. 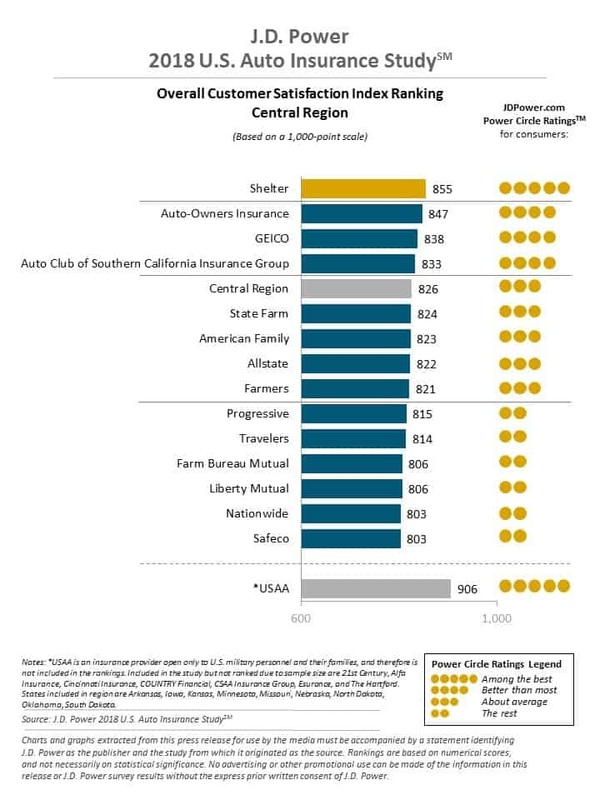 This chart shows which car insurance companies have the largest market share in the state. Just under 923 auto insurance companies are registered in Kansas. Of those, 25 are domestic, and 898 are foreign. Now, let’s look at the best rates on average for top car insurance companies in Kansas. To make sure you get the best insurance coverage for your situation, compare rates from more than one carrier. Maintaining a clean driving record is another way to keep your rates low, which makes understanding and obeying traffic laws common sense to reach that goal. Car insurance companies will usually examine your credit score to determine the rates they will offer you. Drivers who have good credit will often get better rates. The average Kansan has a credit score of 680, they have around three credit cards in their name, and a balance of $6,082. This score is slightly below the 2017 national credit score of 675. Your credit score is definitely crucial in determining your car insurance rates. Now, Let’s look at the rules of the road in the Sunflower State. Insurance laws can vary from state to state, and some of them can make more sense than others. So, it helps to have an understanding of some of the basic driving laws in Kansas to ensure that you’re obeying them. From seat belt to DUI laws, we’ve got you covered. Here’s what you need to know. State insurance commissioners administer laws and regulations. Each state determines the type of tort law and threshold that applies in the state (if any), the type and amount of liability insurance required, and the system used for approval of insurer rates and forms. Insurance companies in Kansas are subject to the regulations the state insurance commissioner sets, which must meet the fair competition standards of the National Association of Insurance Commissioners (NAIC). Drivers who have committed violations or who have multiple penalties on their records, uninsured drivers, and others, must file an SR-22 form. If your license has been revoked or suspended, you may need to file an SR-22 to have it reinstated. Kansas, unlike other states, doesn’t use a point system for traffic violations. You’ll find helpful information about traffic citations by The Kansas Highway Patrol. They also offer useful resources through Public Safety Programs which include the AAA Driver Improvement Program. The Wheat State doesn’t have specific laws requiring insurance companies to offer special glass coverage or no-deductible windshield replacement. The insurance companies can choose aftermarket parts that are of like kind and quality as well as the repair vendor. This detailed summary of windshield and glass coverage in Kansas offers some helpful tips. Insurance fraud is the second largest economic crime in America. To combat fraud, insurance companies raise premium rates dramatically and pass them on to consumers. There are two classifications of fraud: hard and soft. Any way you slice it, insurance fraud is a crime. Any kind of willful misrepresentation of facts is known as “rate evasion” and is a $16 billion annual expense to car insurers. If you suspect insurance fraud or have been a victim of it, contact the Kansas Department of Insurance to report it. Kansas’s statute of limitations for filing a claim is one year for personal injury and two years for property damage. Residents can renew their registrations and drivers’ licenses, update their addresses, and get their driving histories at The Kansas Department of Revenue’s online portal. They can also easily access vehicle registration and insurance information at the state database. Teens in Kansas can start driving with a learner’s permit as young as 14 years old. Restricted licenses: drivers age 15 but not yet 16 may be granted a restricted license if they have completed driver training. Restricted license holders younger than 16 may not drive unless supervised other than to and from school or work via the most direct route and may not carry minor passengers other than siblings. To get a restricted license, applicants must have driven at least 25 of the 50 hours required for a full license and must have held an instruction permit for 12 months. Learner’s permit and intermediate license holders also can’t use handheld devices. The minimum age for a full driver’s license is 16. Before being granted a license, teen drivers have a mandatory holding period of 12 months. They also must have a minimum supervised driving time of 25 hours in the learner phase and 25 hours before age 16; ten of the 50 hours must be at night. Nighttime restrictions 9 p.m. to 5 a.m. Neither senior drivers nor the general public can renew online, but the state is currently in the process of launching a new online renewal system. For more information as it applies to your situation, visit the Kansas Department of Revenue – Motor Vehicle Division website. Kansas drivers younger than 65 years old must renew their licenses every six years. Be aware that proof of adequate vision is required at every renewal. Want to know the best part? The state is currently in the process of launching a new online renewal system. First offense: no less than five days nor more than 90 days of imprisonment, or fines no less than $25 nor more than $500, or both imprisonment and a fine. Subsequent offenses: no less than ten days nor more than six months of imprisonment, or fines no less than $50 nor more than $500, or both imprisonment and a fine. If you don’t follow the rules, of course, you could be breaking the law. That can lead to fines and penalties. For more information about Kansas’s rules of the road, keep reading! As we explained earlier, Kansas is a “no-fault” state. Drivers in car accidents there must file a claim with their own insurance company first, using the state-required “personal injury protection (PIP)” coverage. If your case meets the requirements for serious injuries, you’ll also want to be aware of Kansas’s modified comparative fault rules. At a trial, a judge or jury calculates the percentages of fault for each driver and reduces every driver’s liability accordingly. For example, if a driver suffers $10,000 in damages, but is found to be ten percent at fault, his or her recovery will be limited to 90 percent of the damages, or $9,000. A driver who is 50 percent or more at fault can’t recover any damages. Kansas state law allows passing on the left lane only when drivers make a left turn or are passing other vehicles. When drivers approach a stationary emergency vehicle displaying flashing lights, including towing and recovery vehicles traveling in the same direction, they must move to the closest lane, if safe and possible to do so, or slow down to a speed adequate for road and traffic conditions. These laws help protect law enforcement, emergency first responders, and maintenance crews from oncoming traffic. No one wants to get a speeding ticket. Get familiar with Kansas speed limits, so that you can avoid potential fines. Please note that these are only the maximum speed limits for each road type — they can vary from roadway to roadway, so pay attention to signs. When it comes to seat belts and car seats, Kansas has specific requirements for children and adults. All children three years old and younger must be in a child restraint; children ages four through seven who weigh less than 80 pounds, and children ages 4-7 who are less than 57 inches tall must be in a child restraint or a booster seat. The law doesn’t require front-seating or rear-seating for children, nor does it require front-facing or rear-facing car seats for children. All children ages eight through 13 years or children ages four through seven who weigh more than 80 pounds and/or who are taller than 57 inches can wear adult safety belts. Everyone 14 years and older must wear a seat belt. Police officers can fine people in the front seats if they’re not wearing seat belts, but for drivers in rear seats, a secondary offense, such as running a red light, is required to enforce the law. The maximum base fine for a first offense is $60 for children ages 14-17 and $30 for adults; additional fees may apply. Cargo areas in pick up trucks: Kansas allows everyone 14 and older, people in parades, or those who must do so as part of their employment to occupy them. The restrictions don’t apply to vehicles not being operated in the state highway system or within the “corporate limits” of a city. Rideshare services like Uber and Lyft mandate that all their drivers carry personal car insurance policies that align or exceed the minimum coverages state law requires. If you are thinking of ridesharing, make sure to ask your provider if they offer ridesharing insurance. In Kansas, those companies include Farmers Insurance, GEICO, and USAA. Automation is the use of a machine or technology to do a task or function a human once performed. In driving, automation involves using radar, camera, and other sensors to get information about a vehicle’s surroundings, which computer programs use to do all or part of the driving. Currently, Kansas has no restrictions on autonomous vehicles. Traffic laws are designed to keep everyone safe. The Kansas Department of Transportation (KSDOT) has developed the Highway Safety Improvement Program to offer drivers tips, facts, and interactive maps and guides. In compliance with the National Highway Traffic Safety Administration (NHTSA), Kansas has also issued a Highway Safety Plan. The Blood-Alcohol Content (BAC) limit in Kansas is 0.08 percent and the High BAC limit is 0.15 percent. Read this helpful guide for more information about DUI penalties in Kansas. Other Possible one-year vehicle impoundment. Completion of substance abuse and treatment program. Completion of a court-ordered substance abuse program. Possible one-year vehicle impoundment. Completion of a court-ordered substance abuse program. Kansas doesn’t currently have any specific marijuana-impaired or drugged driving laws. Since the smartphone became popular, distracted driving has become as dangerous as driving under the influence of substances. Kansas state law bans texting for all drivers. Learner’s permit and intermediate license holders also can’t use handheld devices, however, full license holders are allowed to use them. And remember: in Kansas, an officer can pull you over just for texting on your phone. So, it’s better to be safe than sorry and save the texting for off the road. 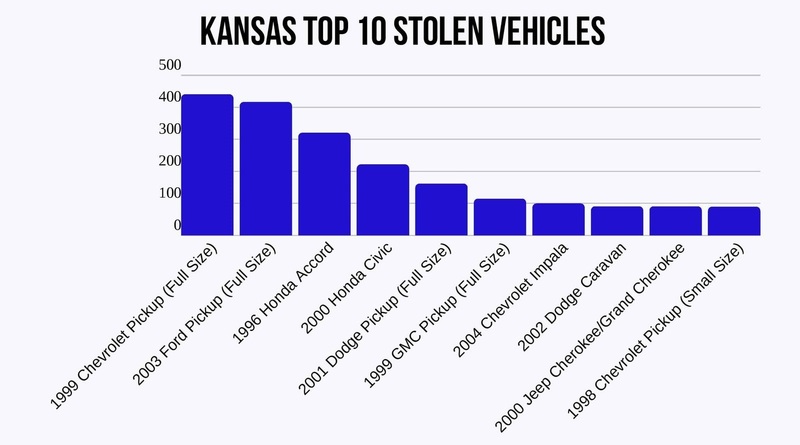 Let’s check out some fascinating Kansas vehicle theft and crash statistics. As you can see, Kansas car thieves love to take full-size pickup trucks. The table below gives a breakdown of the top cities for auto theft within the state. Here are some sobering facts to keep in mind about driving-related fatalities in Kansas. These are some interesting details about car ownership and commute time in Kansas. In Kansas, traffic jams are a mere blip on the map compared to the national average and to more populated states. At 18.5 minutes, Kansas drivers beat the national average commute time of 25.3 minutes. Only 1.15 percent of Kansans have a “super commute” of 90 minutes or more. Now that you’ve learned all you need to know about Kansas driving laws and insurance, you’re ready to buy the best coverage you need in the Sunflower State. All you need to do to get the best rates from Kansas car insurers is to enter your zip code to start saving today!